Yum! My husband loves any Mexican food, and I love America’s Test Kitchen, so these are sure to be a winner in our house! Oooh yumm! Nothing like some toasty enchiladas; epsecially with all this rain we’ve been having in MTL. Can’t wait to try these babies out thanks! Ok so here is a question I’ve been wanting to ask someone but never have. Have you ever made your enchiladas with flour tortillas? I know this is not the way they are *supposed* to be made but I have made them with the corn tortillas, and I find I’m not a big fan of the texture of the corn tortilla. Just me though, the huddy loves them. I just didn’t know if flour tortillas would hold up. Until I moved to Kansas, mexican was not on my list of foods I cooked regularly (ok, at all :)) so I don’t have much expertise on the subject. They would be fine with flour! I don’t think they make 6 inch flour tortillas…so I’d just do 6 or 8 large enchiladas instead of 12 small ones. These look fantastic. My DH loves enchiladas. I’m going to have to try this one. 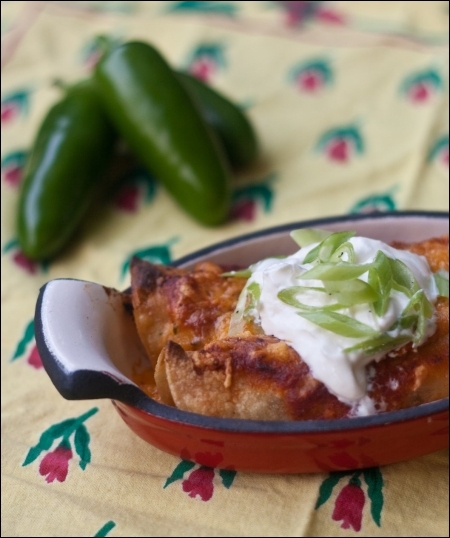 I love enchiladas, and these sound wonderful! Looks like I need to get making some enchiladas! These look wonderful! arrived here via the Foodie Blogroll. What a lovely blog you have, and your photos are absolutely beautiful. I love this recipe, yes, your son will love the corn, I have a 22 month old and a almost 3 year old and they do love it too..btw, the NYC pics were awesome!! Your blog is beautiful!! Your photos are making me hungry…at 7:45am! I haven’t made enchiladas in a while, your chicken ones look perfect! 2. Could you list some basic spices to keep on hand. I have a drawer full of spices I don’t use but come across reicpes for spices I don’t have but seem to reoccur. Love the recipies now to try them. Charlie – if you follow the recipe, you will have made your own sauce. So much better than the canned stuff! As for the spices, it might be wise to purchase a spice rack. They usually come filled with basic spices, and they cover a good scope of everything. A spice rack can’t handle my plethora of spices I’ve collected at this point, so I use my lazy susan. Spices that I use on a weekly basis are chili powder, ground cumin, paprika, ground mustard, coriander, garlic powder, crushed red pepper and whole black peppercorns. It’s also a good idea to have spices on hand for baking. I find that the most used for these applications are ground cinnamon, ground cloves and ground allspice. I’ve just made these (with a few adjustments for what we had in the house!) and they were absolutely delicious. Not quite as pretty as yours, but I’ll definitely be making them many times in the future, so I’m sure I’ll be working on that. Thanks for the recipe! Yum, my mouth is watering! I am an enchilada fan. Fabulous pictures by the way! Thanks for this tip, Debbie! It never ceases to amaze me the differences in labeling from country to country. Take care! This recipe is a favorite in our house! Thank you! Quick question, can you make and put them together in advance and leave them in the fridge to bake later? Or will the tortillas get soggy? Thanks for your help! Great recipe! Ashley, I have made them in advance. I assemble and roll the tortillas, but wait to top them with sauce until right before baking. That ensures they don’t get too soggy! It’s great to see the boom in craft breweries in the past years. Wonder when we’ll see market saturation. Nancie, they do freeze just fine. Do as you said, and freeze the sauce separately though – then assemble right before baking. Enjoy! I found this recipe via pinterest in a search for enchiladas – I substituted minced turkey and it was amazing!! Thanks for this great dish! And a big hello from an SSU alumni (well now it is SU) gotta love the Eastern Shore!! Danielle, too funny my husband and I were just talking about the fact that we still call it Salisbury State. Such a good school to have here on the Shore – and the campus is growing more and more everyday. Glad you liked the enchiladas, they are a favorite around here. We love them with turkey as well! Okay once again, we made these on Thursday for dinner. Normally Jimmy orders fish with the guys on base every Friday but he wanted the enchiladas for lunch and then he wanted them again for Friday night dinner I try to mix things up and they keep well after cooked but that sauce just blows me away and it is really so easy if you have the supplies on hand which I always have. I will have to try them with Turkey. We had left over sauce so I figured I would save it for another meal and I came to the kitchen and Jimmy had all the rest of the sauce over the enchiladas and added a bit of cheese on top. Then to top it all off we had sour cream, a few jalapenos and some chopped tomatoes after cooked. They are now all gone but I got the last one LOL One of my very favorite recipes but I love everyone I have tried. Thanks for reminding me and each time I am making something I go check out this site first because you make things easy but so tasty. If a mom with three 1/2 men in the house can whip this up you know you can do it. Just follow directions. I will never again use canned sauce. I have to check and see if you have mole sauce on here. I made it before but not sure if I used a recipe from you or Emeril Lagasse. I would take your recipe over his any day as his have so many steps. Thanks!! Hey, I have now made this recipe like a thousand times, though to be fair I tweek it a little to my own taste. I was wondering though…. how long could you keep the enchilada sauce in the refrigerator do you think? Im considering making this tomorrow night for dinner and making extra sauce and filling for another dish on Tuesday… Please tell me what you think! It would be fine up to a week in the fridge! Or, it freezes great too. I have leftover chicken I’d like to use for this recipe. Do you know how many cups I would need for this? Thank you! A little over 2 cups, Janet!